Welcome to Hill Valley 2015. This is a site dedicated to Back to the Future. Here you will find information on all three films and Back to the Future the ride at Universal Studios. Also visit Back to the Future's Site at www.bttf.com and www.bttfmovie.com, and visit the message board. Two updates today! I've added the first two scenes to the Back to the Future 4 section, "you have to start somewhere", when you view them you'll see why I said that. Three new deleted scenes have been added to the Back to the Future 2 section. 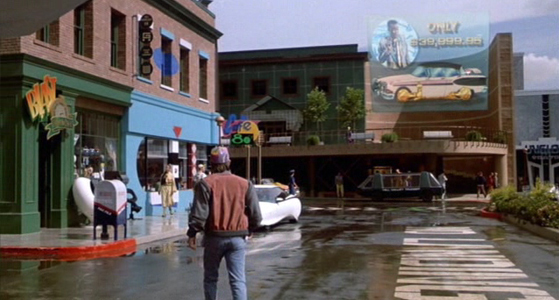 Also, the first three scenes are now finished in the Back to the Future 2 section. Scenes 18, 19, and 20 are finished, thus meaning the Back to the Future Section as a whole is complete. Look forward to other updates in the coming...future. Scenes 15, 16, and 17 have been completed in the Back to the Future section. The others will be along shorty, I'm also planning on adding another page to the site in a short while, so look forward to that. Let the festivities begin! Hill Valley 2015 is open! Great Scott! We are currently under construction, so bear with us!